I now own a pair of Salomon Fellraisers. If nothing else, the shoe’s name is cool as heck. 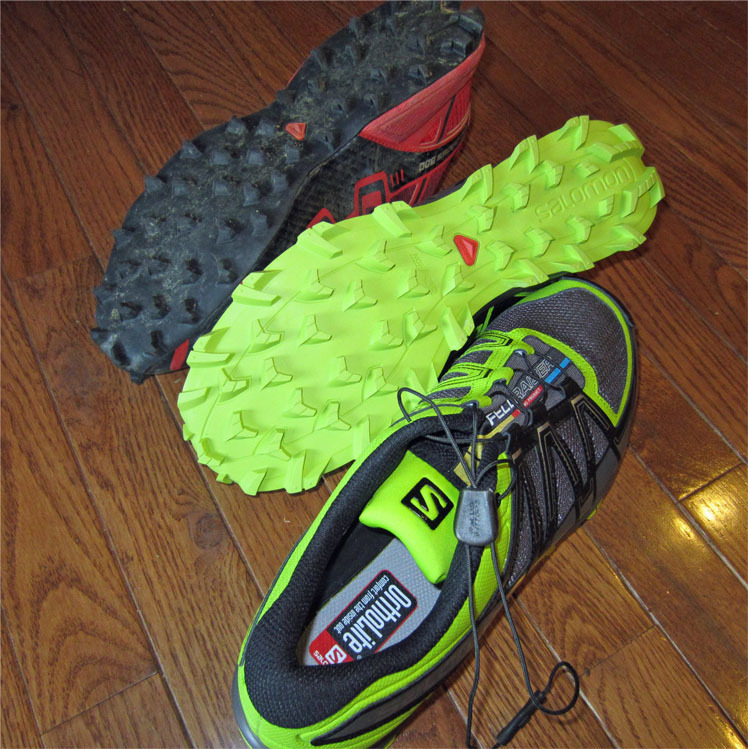 Salomon describes the shoe as designed for ground feel, mud/snow grip, & to be lightweight. Sounds good! My first thoughts out of the box were “thank goodness they are green instead of red” and “these puppies have some serious tread”. The tread is in large chevron patterns and even more aggressive than my Fellcross – see photo. Not as much mesh as my Inov-8 X-Talons or Trailrocs, which probably means they don’t dispel water as quickly. That’s important to me and I’ll soon find out how they stand up to mud and water. On the flip slide, the components of the shoe appear to be more durable than the Inov-8s. They are certainly not as minimal. The look of the shoe is “ehhhhh”, but that’s not a big deal for me. I tried them on and they are snug at the heel and mid-foot, but room in the toe box (all good things). They pass the test for a shoe that is worth trying. How did the shoes perform in an actual race? After wearing these shoes at Mud Guts & Glory, I have mixed feelings about the Fellraisers as an OCR shoe. My initial thoughts about the shoe proved true and I wasn’t surprised at all. They are not the perfect OCR shoe, but I have seen a lot of other shoes worn at races that aren’t this good. The Fellraisers are sturdy and provide a lot of protection to all parts of the foot. You don’t have to worry about stepping on sharp rocks or stubbing your foot on a root. A plus (big plus) for me personally is that they have a little more motion control than the Inov-8s, meaning that it stabilized my foot and minimized some of the knee issues I typically have in races. The third positive aspect is that they were very grippy for the scrambles up and down steep, muddy hills. I only lost traction a couple of times on some of the incredibly steep slopes and I don’t know if there is any shoe out there that would not have done the same on those ridiculous hills. The one negative is that once the shoes got water and mud in them, it didn’t come out very quickly. They became slightly heavy — not so heavy that I would say they are ‘bad’ for OCR, but heavy enough for me to notice. My final verdict is that I will use these shoes mostly for training and trail running, and possibly in a few hilly obstacle races that will be light on water and mud. If someone asked me point blank about the Fellraisers as an obstacle racing shoe, I would tell them that they are okay to pretty good, plenty of positives with the one downside that they aren’t as good at dispelling water/mud as other racing shoes. Official Disclaimer: I am not compensated for my opinions and the product was provided as a free trial. thanks for the review, I’m looking forward to seeing how they hold up. What race will you be competing in? Mud Guts &Glory in OH. Great race. I have a review of the inaugural MGG back in Sept. Excellent! Looking forward to seeing how the shoes perform. I’m needing a pair for the Spartan Trifecta next year that will last, ideally through all three races. Combine the Fellraiser with Salomon ankle gaiters! This alleviates the mud/water issues substantially. Combine this with by removing the ortho foot pads so the shoe cannot absorb as much water!